Boat How is the highest point on a large area of undulating high ground between Eskdale and Miterdale, which for our purposes stretches south-west to Eskdale Green. This is a varied area. At the south-western end we find rocky steep sided ground and the southern flank remains steep all the way to Boot. To the north the slopes are more gentle and tree lined, part of the Miterdale Forest. In the middle is a large and often rather wet plateau - White Moss, Miterdalehead Moss and Brat's Moss. At the top the fell rises to a summit at Boat How before dropping down to Burnmoor Tarn. Boat How is in a splendid location, with great views into Eskdale and towards Scafell. Large parts of the fell are very quiet, although Blea Tarn can be a popular target for a shorter walk. This is a large area with several high points rather than a clear fell with lines of approach. Boat How itself can easily be reached in every direction apart from the north-west, where steeper slopes run down to the source of the Mite. Good paths run onto the fell from Boot and Beckfoot in Eskdale. From Miterdale the approaches are less easy, but the open fell can be reached along the lane that passes Low Holme (just north of the Outward Bound in Eskdale Green) or by heading up the valley past Low Place and taking a path that runs up a gap between two areas of woodland. 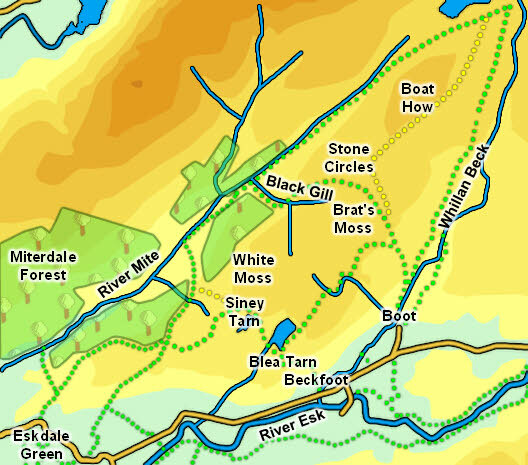 We have one walk that crosses part of the fell, visiting Blea Tarn from Eskdale and another that runs along its northern edge, climbing to the Illgill Head/ Whin Rigg ridge from Miterdale. The summit is a rocky outcropping that sits on top of the grassy plateau. The eastern boundary of the fell is formed by Whillan Beck, which emerges from the north-eastern tip of Burnmoor Tarn then turns south and flows into Eskdale. The River Esk forms the southern boundary of the fell, from the junction with Whillan Beck to Eskdale Green. The River Mite forms the northern boundary, rising in an unusual dell north of Boat How itself and running south-west past Eskdale Green. Burnmoor Tarn sits at the northern end of Boat How, and is shared with Illgill Head and Scafell. Three tarns belong entirely to the fell. Blea Tarn is the largest, overlooking by Bleatarn Hill. Just to the west are Blind Tarn and Siney Tarn, the second of which is slowly filling with rushes. The middle of the fell is covered in stone circles, with at least five clearly identifiable, along with a number of other monuments. The footpath that crosses from Miterdale to Eskdale via White Moss visits three of these stone circles (ignoring the route shown on the OS map). The slopes above Boot are covered with the remains of mine workings, with drifts and disused mine shafts.